There are so many wonderful muffin combinations that involve some sort of nut and some sort of fruit, either dried or fresh. In this instance, we combine dried dates, which are full of natural sugar, and walnuts. 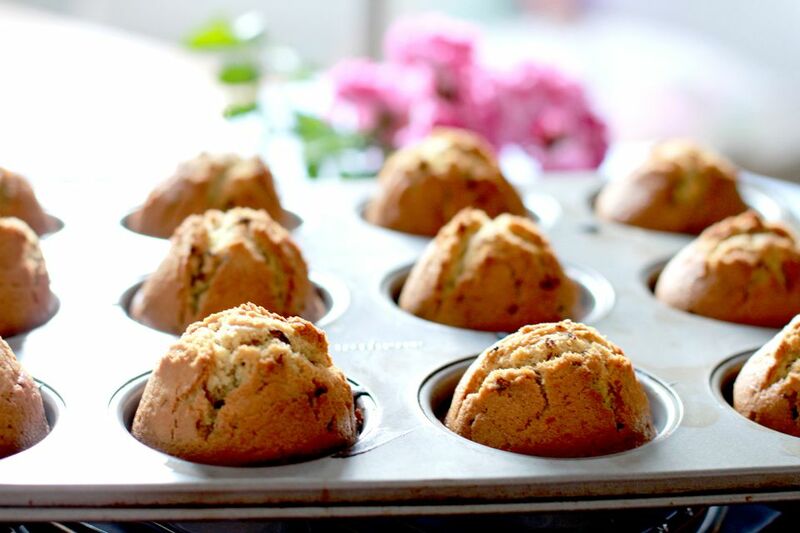 The key to making great date nut muffins is not overmixing the batter. Once the liquid ingredients are added to the dry, mix the batter by hand just until the flour is moistened. You might need to scoop down towards the bottom of the bowl to to reach those stubborn dry pockets, but go easy—too much mixing can cause the muffins to turn out dry, tough or misshapen. Another tip: Stir the nuts and dates in with the dry ingredients rather than adding them into the already mixed batter. Preparing them this way helps prevent them from sinking to the bottom of the muffins while they bake. This goes for all muffin add-ins, by the way, including any type of nuts, blueberries, chocolate chips or whatever. And if you want to spruce your muffins up a little bit, here's a recipe for a simple streusel topping you can mix up in just a few seconds. Combine the flour, dates, walnuts, baking powder, and salt. Pour a tiny bit of the melted butter into the egg-vanilla-milk mixture and stir it in. Repeat 3 to 4 more times, adding a slightly larger amount of the liquid butter each time until it is all incorporated. Add the liquid ingredients to the dry ones and mix. The batter may be visibly lumpy (though you should not see any large pockets of dry flour). Take care not to overmix the batter, or the resulting muffins will be too hard. Fifteen to 20 seconds with a fork should be plenty.